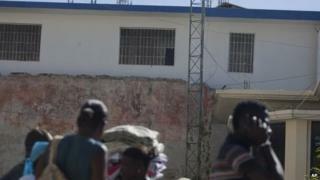 Thirty-four detainees have escaped from a prison in the Haitian city of Saint Marc, 100km (60 miles) north of the capital, Port-au-Prince. The inmates crawled through a window after sawing through its metal bars. Police said so far only four of the fugitives, all of whom were awaiting trial, had been captured. All five guards on duty at the time of the escape have been detained on suspicion of helping them flee, officials said. The jail break comes less than three months after more than 300 prisoners escaped from a prison in Croix-des-Bouquets, on the outskirts of the capital. Haiti's prisons are notoriously overcrowded and violent. Because of the slow pace of the country's justice system many people spend years in jail before their case comes to trial. Haiti continues to struggle to recover from the devastating 2010 earthquake which left much of the country destroyed and crippled its official institutions. According to the World Bank, Haiti is the poorest country in the Americas and one of the poorest nations in the world.